Our rooms are equipped with shower/toilet, radio and cable tv. Hotel Schillerhof is located in the middle of the historical centre of Marbach am Neckar, the birth place of the famous poet Friedrich Schiller. We are a small family run hotel with 6 single rooms and 5 double rooms. All our rooms are non-smoking and are equipped with an en suite bathroom as well as cable TV. The rooms are on the second floor (US: third floor). You will also find an excellent restaurant and butchery in-house. Enjoy our butchery’s homemade delicacies at our healthy and tasty breakfast buffet. Leave the Autobahn A 81 at Pleidelsheim (Exit No.14). Turn left into direction “Murr, Steinheim, Marbach”. After passing the tunnel in Murr turn right - direction Marbach, Ludwigsburg. This is the main street called B27. Follow the green signs “Hotelroute”. Take the the second exit to Marbach (the sign shows direction to the schools and the museums of Marbach) on your left hand side and drive up the hill. Turn left into Marktstraße at the next junction and follow this street until you reach a fountain. 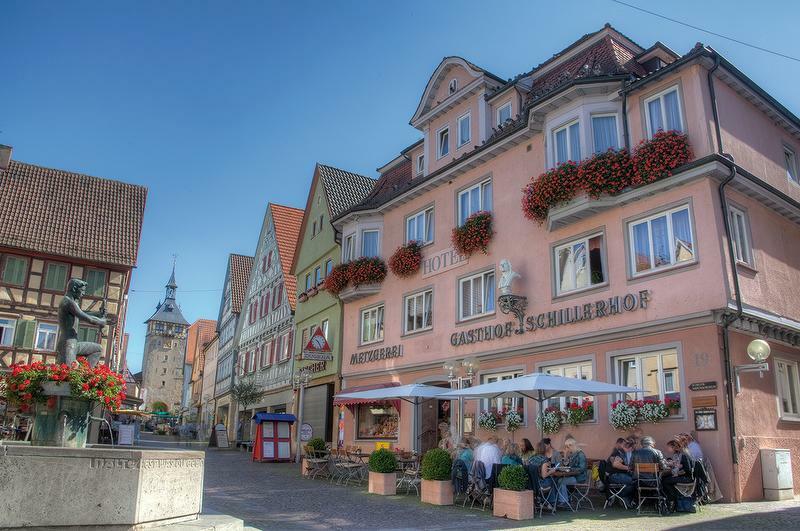 Our hotel is located at the market place, near Marbach’s city hall. Front desk open from 7:00 a.m. until 11:00 a.m. and 3:30 p.m. until 6:30 p.m.